I love cooking with my sister. Times with her in the kitchen are always so fun and innovative—daring and challenging. Therefore, when she invited us over one day to experiment with new dishes, I was ALL IN! As a San Francisco resident, my sister has access to a wealth of beautiful products at her disposal and she definitely takes advantage of it. SF is a Foodie Paradise filled with delicious produce, sumptuous bakeries, savory proteins, and of course, amazing wines. 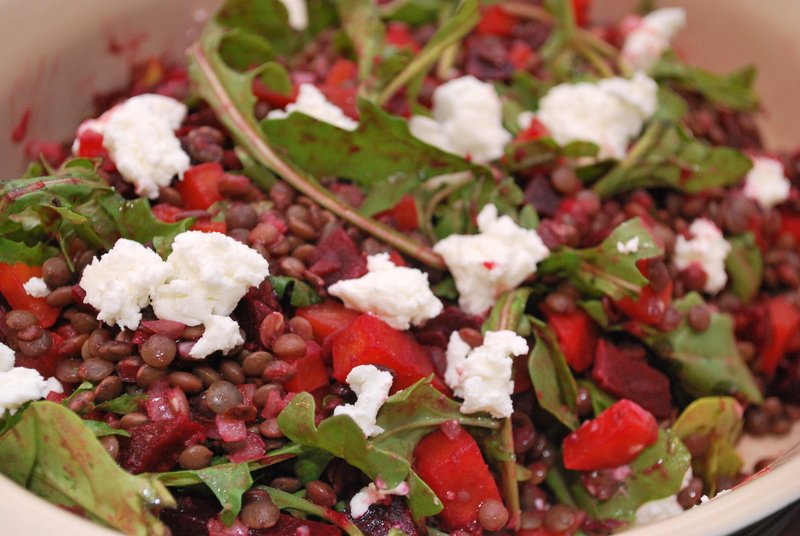 So it was no surprise that one of the dishes she wanted to give a spin at was a French Lentil and Beet salad. Beets. I know– I had made the same face at first. To that day, I hadn’t had good experiences with them as I mostly sampled them from a can or a salad bar. BLEH! 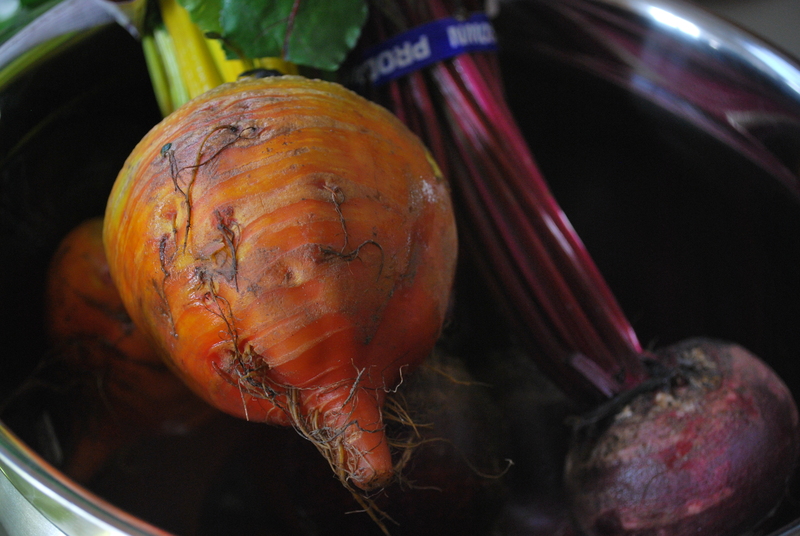 But the sister assured me that by roasting the gorgeous golden and red beets it would bring out a decadent sugary component. 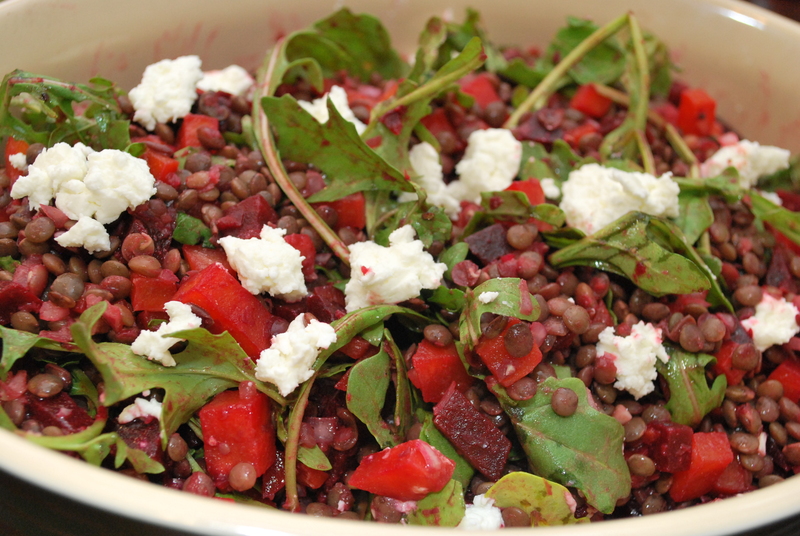 As for the French Lentils—wow. Picked up at a local grocery cooperation (Rainbow Grocery in San Francisco), they were absolutely beautiful. Nutty in flavor and deeply earthy. Sorry, I know my description didn’t do it nearly the justice it deserves. The end product was absolutely amazing—a perfect dish for the upcoming summer months. The sugary beets complimented the rich textures of the lentils while the goat cheese (Chevre from Cowgirl Creamery) added phenomenal creaminess. The vinaigrette was light but had a great amount of acidity while the baby arugula rounded out the dish with a peppery punch. Would I suggest it? DEFINITELY! Use Martha’s version as a starting point and add or take away any items you’d like. Leftovers are just as yummy, too! had i been a vegetarian, i’m sure it was delicious!! Funny that you’d say that because I didn’t think it would be as tasty as it WAS. Though–I think you’d appreciate the Chevre in it—YUM! maybe i would like this salad, as an accompaniment to my big fat juicy end cut of prime rib and au jus. What if I don’t like beets NOR lentil?? 😛 But I loooooove goat cheese. Like with a passion. Hahah, Carol! Now THAT is a challenge! I’d venture you’d think postively on a few spoons of this salad—especially if I made sure that EXTRA chevre were on those spoonfuls! Seeing as how both of the people who commented made similar “faces” when they read “beets”, “lentils” as you did, they should have also acknowledged how you were pleasantly surprised by how good it was after all! I challenge them to give the above recipes a try! oh anonymous, how clever you are – not! i might take your challenge to “try” the salad if someone made it for me (vs. try the recipe). but, that someone would have to have access to all of those fresh ingredients because ya’ll know i lack a decent farmer’s market in my hood. p.s. can we also add some large chunks of bacon bits? !